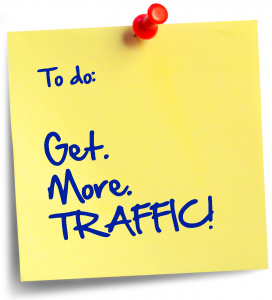 Hello and welcome back to Three Money Methods Traffic Tuesday! This is Jonathan Kraft and today we’re going to be doing a follow-up on last week’s conversation about blog commenting. I got some feedback from the video and I love that feedback – it’s so great to get some feedback from people as far as things I can do better and ways I can help you better. So definitely keep the feedback coming in! Ok! Well here is my gmail account. Let’s say you had logged in and this is our ThreeMoneyMethods [AT} gmail. By the way, don’t send us email here – I will not get the email if you send it here. By chance I might pick it up, but chances are not good! So don’t send us email here; if you want to send us an email, use the email that came to you with this content. If you want to log in, so what we’re going to do here is we’re actually just going to log out of this gmail account – well, I’m logged in. I’ll take it that you can figure out how to go to www.gmail.com or go to www.Google.com/mail. Once you’re logged in there, you’ll see that there’s a place you can click on up top that has a little thing that says, “Reader.” Alright? Inside of Reader here, you can go into Google Reader; this is all of my items from last week in Google Reader. If I click on Settings in here, this is where you are going to upload the OPML feed that I gave you last week with all of these blogs; it’s about 260 marketing-related blogs that you can just upload right in this import/export tab. What you’ll do is you’ll click “upload” and you’ll find the OPML file, it’s an XML file that you downloaded from me. You’ll upload it right into here –you’ll click “browse, you’ll find it on your computer and then you will upload it clicking this button. Once you do that, you’ll go back to your Google Reader and you’ll see inside of Google Reader that you now have all of the exact same blogs that I have that I’m posting comments on. These are some of the top marketing blogs on the internet. You can also add your own Google Reader items by adding a subscription. You’ll just type in www.”whatever”.com – whatever the web address is and Google Reader is going to go out and try and find a feed at that website. You don’t have to know all that stuff; feeds and how does RSS work – you don’t have to know all of that. Just take the OPML feed, upload it and start commenting on other people’s sites. I love the feedback from people going, “Hey, I’ve been commenting on other people’s websites and I’ve been getting some traffic to my site – it’s cool! I love it! Thanks so much!” Love that feedback! It’s really cool that people are actually taking action on the information. The other comment I got from people is, “Hey, you know Jonathan, this sounds great, but I don’t have 30 minutes a day to go and post to these websites. Isn’t there someway that I can have someone else do that work for me?” Well, two things to be aware of: yes, is the answer to that question; the other thing is what you’re doing when you go out to these other websites is you’re building relationships. If you’re comfortable with someone else building relationships on behalf of your business, then yes, absolutely you can have somebody else go and post comments. You could pay them or here’s what I figured out, you can actually just hire an intern. There are a lot of people looking for internships in the internet marketing space. So what I’ve done is created a job description for someone who wants to go and post on blogs. What I want to do is find someone who is a Marketing Blog Commenter and I will give you this text too actually – just because I’m a nice guy. There are so many people in the world who would love to be paid $9 an hour just to go and read and post comments. There are so many people who would love to do that. And where do you find those people? Well, one great place is Craig’s List! You just go log-in to Craig’s List, create an account at Craig’s List, post a new ad; you’ll see it’s very easy. I’m posting a new ad in Denver because that’s close by to where I live, but you can post an ad anywhere. I’m “Offering a Job” …. “Denver” …. and I’m looking for an internet internship … let’s go “Marketing/Advertising/PR” … there’s my current total, it’s going to cost me $25. Then I’m just going to post the ad right inside … post it or paste it. Compensation: I could just copy and paste from here.. “First 30 days unpaid; $9 an hour after that … up to $9 an hour. Contact From – I don’t know Contact From is … I’ve never seen that before, that’s new to me. Telecommuting is fine; part time is good; it’s contract-type work; it’s an internship and that’s fine. I will go ahead and click Continue here and there’s my post: “If you enjoy reading about marketing, blah, blah, blah. Wicked smart, detailed-oriented, funny is a plus, if you’re not familiar with RSS/Google Reader,” all my apostrophes turned into funny characters which stinks because then I need to go back and edit it, but otherwise this is my job posting and this is where we’ll find somebody, on Craig’s List. Craig’s List will then send me emails when people respond to this ad. I’ll get emails from people who are interested in the ad. So that’s really all you have to do to find somebody to do this kind of work for you. And you will get responses from posting this job posting if you post it in a busy market where people are actually looking for this kind of work. You’re going, “well I don’t want to spend that kind of money.” You have to spend some money to get someone’s time or you have to use your own time to get the money! Those are your two options. At any rate, here’s what I’m giving you: this whole job description is yours at ThreeMoneyMethods.com. If you’re not reading this on the blog, then you are not seeing this text; but you can come to ThreeMoneyMethods.com and put your name and email in and I’ll be happy to give you this text in exchange for you having come to the website, and putting your name in here. You can also learn a little more about me and my background and what we’ve been able to do because of our internet businesses. But what you’ll do is just come to the website and put your name and email in here. Then you’ll get that OPML feed for free that I mentioned and you’ll also get the text for this job posting via Three Money Methods. So I hope that makes sense, but seriously, by doing this blog commenting, you can drive so much traffic! I had a day in the last week where I had 50-plus visits just from going and commenting on other people’s blogs. It’s just not that hard and it just doesn’t take that much time. By the way, yes I am interested – if you’re a person who wants to be paid $9 an hour and is willing to work for the first 30 days for free to go and post comments on behalf of Three Money Methods and they’re good comments, I would love to talk with you further to see if this would be a mutual fit for us. Thank you for watching the video and be sure to come back – next week, we’re going to have another great video from Three Money Methods about how to really drive traffic to your website and how to start generating revenue from the traffic that you’re bringing in.